Julie Mitchell recalls seeing her father in restraints during visits to see him in long-term care in 2011, when his dementia advanced to the point he could no longer live at home. “In waking hours, if we weren’t there, he was restrained in a chair with a belt around him,” said Mitchell, one of 13 children raised by John Joe and Elizabeth Pidgeon in Marystown, N.L., population roughly 5,300, located 300 kilometres from St. John’s. A report released last week by the Canadian Institute for Health Information (CIHI) found that 12.1 per cent of seniors in long-term care homes in Newfoundland and Labrador are kept in daily physical restraints, second only to Yukon, at 14 per cent. The Canadian average is 5.7 per cent. 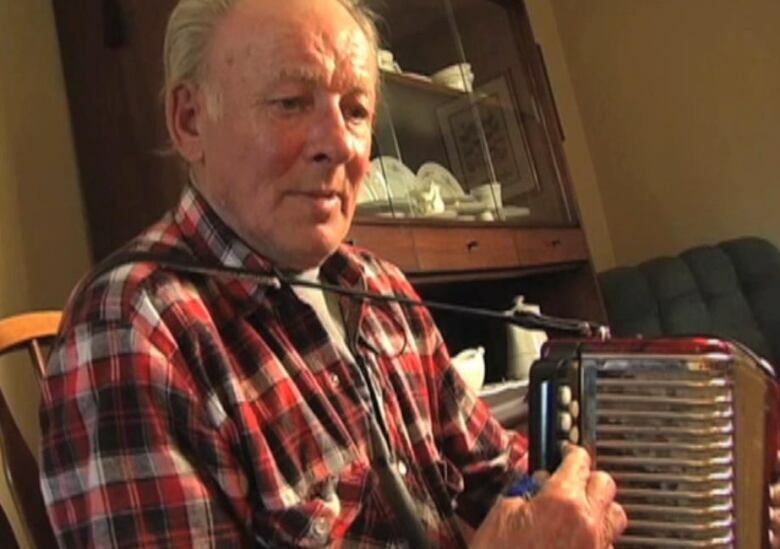 Pidgeon, who died in 2014 at 81, was a local celebrity, an accordion player who loved to play for community events and who took great pride in teaching the tricks of the trade to young traditional music enthusiasts. Dementia changed all that. In 2010, Mitchell and her siblings decided their father had to be placed in long-term care for his own safety because of his tendency to roam. 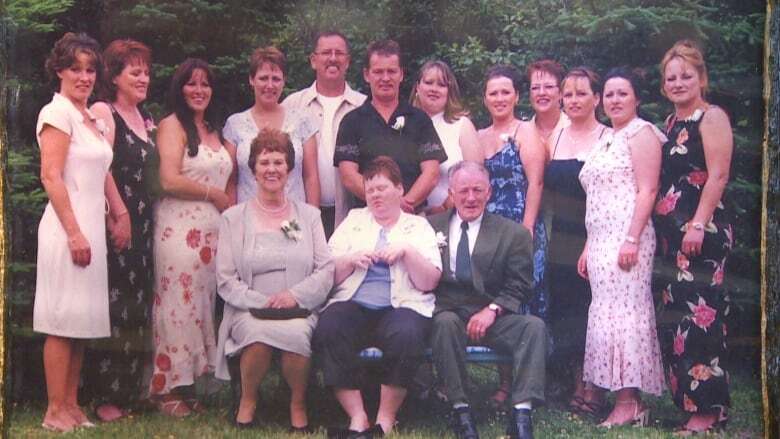 At the time, the only available space was at the Burin Peninsula Health Care Centre, 16 kilometres away from the family home, where he would spend eight months while he waited for a bed in a facility that specializes in caring for people with dementia. During his time there, Mitchell said her dad was only freed when he had a visitor. CBC News made repeated attempts to interview the province’s health minister, John Haggie, and was instead directed to the four regional health authorities in the province, who all said that long-term care homes employ a “least restraints” policy, using physical restraints only as a last option to protect residents’ safety. Eastern Health, which oversees the Burin Peninsula Health Care Centre, declined to be interviewed. Restraints come in many forms, such as belts and straps used to prevent seniors from getting out of their chair or out of bed. Sometimes a tabletop is used to block a person who is sitting from getting up. 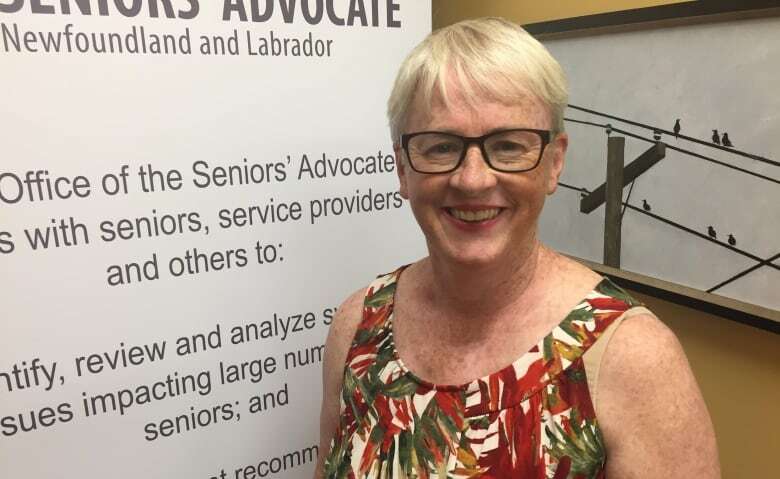 Newfoundland and Labrador’s seniors’ advocate says what to do about seniors who require 24/7 care is a complex problem that will require a shift in thinking, better training and more staff in long-term care facilities. “We should not be restraining the most vulnerable, the … frailest, sometimes the most confused people in our population,” said Suzanne Brake, who worked in seniors homes as a social worker and in other roles in the 1980s and 1990s, and was appointed in 2017 as the province’s first seniors’ advocate. Brake is also concerned about the use of anti-psychotic drugs to restrain seniors in long-term care. 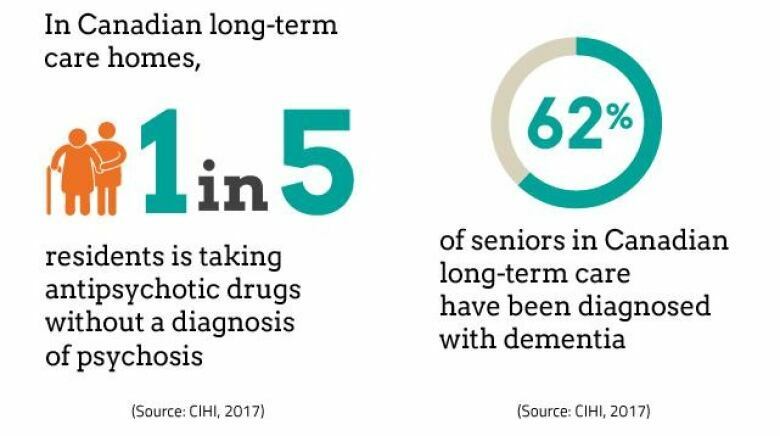 One in five seniors in long-term care in Canada is potentially being prescribed anti-psychotic drugs despite having no diagnosis or history of psychosis, according to the CIHI report. Once again, Newfoundland and Labrador tops the list, at 35.4 per cent. Alberta has the lowest rate of the provinces surveyed, at 19.1 per cent. “Putting in good training, solid training … in terms of how to address people who live with dementia is a much better approach to take,” said Brake. Mitchell said the staff were “exceptionally good” to her father but says she recognizes they had many other patients they were responsible for. She questions the staffing levels in long-term care. Brake says staffing levels are definitely falling short. Brake says the system can and should do better, but that it would be impossible for long-term care facilities to provide constant care to patients who need it. CIHI is a taxpayer-funded non-profit organization that collects data about various aspects of Canada’s health care system. Not all of the provinces and territories participate, but the latest report includes full coverage in British Columbia, Alberta, Saskatchewan, Ontario, Newfoundland and Labrador and Yukon, and partial coverage in Manitoba, New Brunswick and Nova Scotia, representing approximately 60 per cent of long-term care facilities in the country.